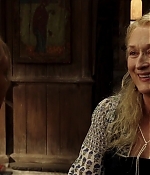 Simply Streep – The Meryl Streep Archives » Mamma Mia: Here We Go Again! Universal Pictures has a nice surprise for us today. 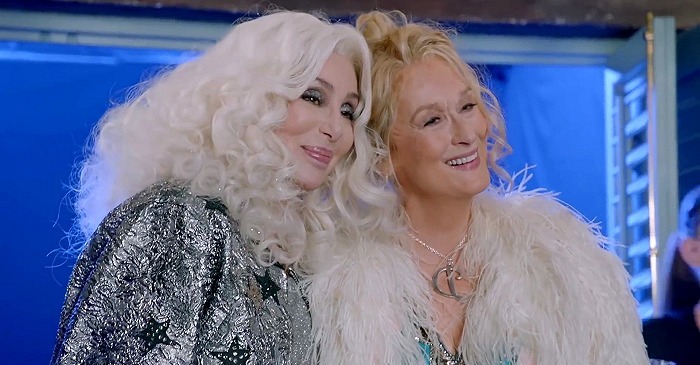 While the promotion for “Mamma Mia: Here We Go Again” has already started with a bunch of (more or less dreadful) tunes by the younger cast, we now have the first official featurette with a focus on Cher’s character, and – surprise, Meryl Streep’s in it as well, talking about her former and current co-star. So, nevermind if Donna Sheridan is dead or alive, Meryl has participated in the official promotion and I’m sure there’s much more to come. The featurette can be watched below and in our video archive. Screencaptures have been added to the photo gallery. According to Variety, Cher has joined Universal’s “Mamma Mia: Here We Go Again!” The multi-hyphenate hinted at her appearance in the movie over the weekend in a tweet and Variety has confirmed that she has been cast in the film. Meryl Streep, Colin Firth, Amanda Seyfried, and Christine Baranski are returning, with Ol Parker writing and directing. The film goes back and forth in time to show how relationships forged in the past resonate in the present. Lily James will play the role of Young Donna. Young versions of Rosie and Tanya will be portrayed by Alexa Davies and Jessica Keenan Wynn, respectively. Young Sam will be played by Jeremy Irvine, while Young Bill is Josh Dylan and Young Harry is Hugh Skinner. The movie began shooting in September in the U.K. and Croatia. Littlestar’s Judy Craymer and Playtone’s Gary Goetzman, who produced the original, will re-team for the sequel. Craymer is also the creator and producer of the stage musical. Benny Andersson and Björn Ulvaeus are aboard again to provide music and lyrics and serve as executive producers. Universal’s Kristen Lowe and Lexi Barta will oversee production for the studio. The original 2008 movie was a surprise blockbuster, grossing more than $600 million worldwide. “Mamma Mia: Here We Go Again!” hits theaters on July 20, 2018. Many thanks to my news-heroes, Frank and Glenn, for the heads-up. 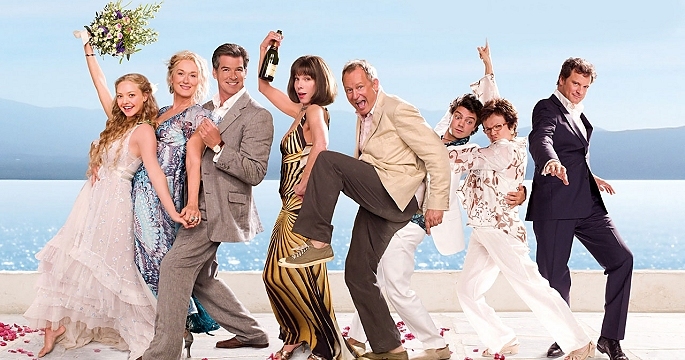 As it tunes up for a July release, Universal’s Mamma Mia! Here We Go Again has added Andy Garcia to the cast. The sequel to 2008’s toe-tapping $610M worldwide grosser will return audiences to the magical Greek island of Kalokairi in an original musical based on the songs of Swedish pop sensations, ABBA. Garcia is stepping into a new role that is being kept under wraps. He joins the previous film’s Meryl Streep as Donna, Julie Walters as Rosie and Christine Baranski as Tanya. Amanda Seyfried and Dominic Cooper reunite as Sophie and Sky, while Pierce Brosnan, Stellan Skarsgård and Colin Firth return to play Sophie’s three possible dads: Sam, Bill and Harry. The story goes back and forth in time to show how relationships forged in the past resonate in the present, Lily James, Alexa Davies, Jessica Keenan Wynn, Jeremy Irvine, Josh Dylan and Hugh Skinner are the young versions of the original leads. Ol Parker writes and is directing Mamma Mia! Here We Go Again from a story by Catherine Johnson, Richard Curtis and Parker. It’s produced by Judy Craymer and Gary Goetzman. Abba’s Benny Andersson and Björn Ulvaeus are providing music and lyrics and serve as executive producers. Tom Hanks, Rita Wilson, Phyllida Lloyd, Richard Curtis and Nicky Kentish Barnes also serve as executive producers. Universal’s Senior Vice President of production Kristen Lowe and Creative Executive Lexi Barta will oversee production for the studio. Many thanks to Frank and Glenn for the heads-up. Universal Pictures announced today that principal photography has begun on Mamma Mia! Here We Go Again. Ten years after Mamma Mia! The Movie grossed more than $600 million around the world, you are invited to return to the magical Greek island of Kalokairi in an all-new original musical based on the songs of ABBA. With the film’s original cast returning and new additions including Lily James, the musical comedy will open on July 20, 2018. Mamma Mia! Here We Go Again is produced by Judy Craymer and Gary Goetzman, producers of the original film. Craymer is also the creator and producer of the worldwide smash-hit stage musical. Ol Parker, writer of The Best Exotic Marigold Hotel, writes and directs the sequel from a story by Catherine Johnson, Richard Curtis and Parker. Benny Andersson and Björn Ulvaeus return to provide music and lyrics and serve as executive producers. Tom Hanks, Rita Wilson, Phyllida Lloyd, Richard Curtis and Nicky Kentish Barnes also serve as executive producers. Reprising their roles from Mamma Mia! The Movie are Meryl Streep as Donna, Julie Walters as Rosie and Christine Baranski as Tanya. Amanda Seyfried and Dominic Cooper reunite as Sophie and Sky, while Pierce Brosnan, Stellan Skarsgård and Colin Firth return to play Sophie’s three possible dads: Sam, Bill and Harry. As the film goes back and forth in time to show how relationships forged in the past resonate in the present, James will play the role of Young Donna. Filling the roles of Young Rosie and Young Tanya are Alexa Davies and Jessica Keenan Wynn. Young Sam will be played by Jeremy Irvine, while Young Bill is Josh Dylan and Young Harry is Hugh Skinner. According to Variety, Lily James has joined the cast of Universal’s “Mamma Mia” sequel, titled “Mamma Mia: Here We Go Again.” Meryl Streep, Colin Firth, and Amanda Seyfried are returning with Ol Parker writing and directing. James will play “Young Donna.” The film goes back and forth in time to show how relationships forged in the past resonate in the present. Littlestar’s Judy Craymer and Playtone’s Gary Goetzman, who produced the original, will re-team for the sequel. Craymer is also the creator and producer of the stage musical. Benny Andersson and Björn Ulvaeus are aboard again to provide music and lyrics and serve as executive producers. Universal’s Senior VP of production Kristen Lowe and Creative Executive Lexi Barta will oversee production for the studio. 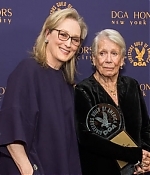 James had been weighing a handful of big studio tentpoles over the past couple weeks following the success of crime caper “Baby Driver.” The rising talent broke on to the scene in the acclaimed series “Downton Abbey,” and followed that up with her role as the lead in Disney’s “Cinderella.” She is also in the Winston Churchill biopic “Darkest Hour,” scheduled for release this fall. “Mamma Mia: Here We Go Again” will open on July 20, 2018. Many thanks to Glenn for the heads-up. Universal announces Mamma Mia: Here We Go Again! Today, Variety brings us some surprising, very unexpected news. Universal is officially moving along on a sequel to the 2008 hit “Mamma Mia,” with “The Best Exotic Marigold Hotel” scribe Ol Parker writing and directing the new movie. 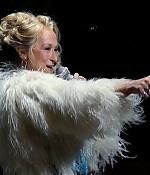 The studio also dated the film, titled “Mamma Mia: Here We Go Again!,” for July 20, 2018. Playtone Pictures, which produced the first pic, is back on for the sequel. Universal has been bouncing around ideas for years on how to proceed with the box office smash. Sources say that one angle could focus on Meryl Streep, Colin Firth, and Pierce Brosnan characters years before the original takes place. The first film is based on the iconic musical about a bride-to-be trying to find her real father told using hit songs by the popular ’70s group Abba. The sequel will feature Abba songs not featured in the 2008 movie, “along with some reprised favorites,” according to the studio’s announcement. Littlestar’s Judy Craymer and Playtone’s Gary Goetzman, who produced the original, will reteam for the sequel. Craymer is also the creator and producer of the stage musical. Benny Andersson and Björn Ulvaeus are aboard again to provide music and lyrics and serve as executive producers. Parker is best known for writing both “Best Exotic Marigold Hotel” movies.